The Tile Phone Finder - Key Finder - Item Finder is a small, square, Bluetooth 4.0 device that can help your locate lost items. I've been using it with my iPhone 6S via its free app. The operation is simple. I paired the Tile with my iPhone, attached it to my keyring, and let the two devices keep in touch with one another. In the event that my keys are accidentally left behind between couch cushions at a friend's house, I can open the Tile app and find out where they were last registered by the iPhone. It will show me the general proximity on a map. Then all I have to do is return to the scene, navigate to the keys via the app, and tap the Find button to initiate musical tones from the Tile so I can discover its location. Lost keys between couch cushions? 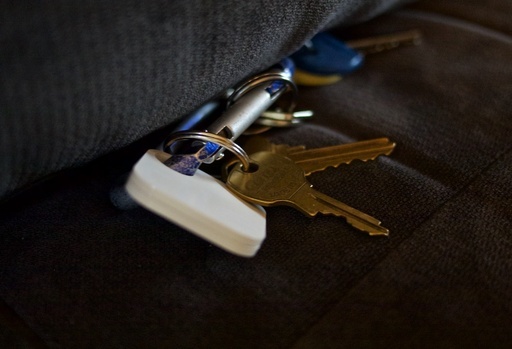 A Tile attached to the keyring (the square white object) will communicate with your iPhone to help you locate them. Tiles run $25 each or cheaper in combo packs, have enough battery juice for a year, then can be turned in for a new tile (at a reduced price). It's not realtime tracking, but the system is clever. Knowing the last spot where your phone and keys were in the same proximity is helpful. And being able to initiate the audible sound when you're close is effective. Tile is an fun high-tech stocking stuffer. And it most likely will be included on my holiday gift list.